This the story of how we put together the Sombra recording. Rehearsing in the yard. Left to right, Peter, Hall, Fred and Tripp. 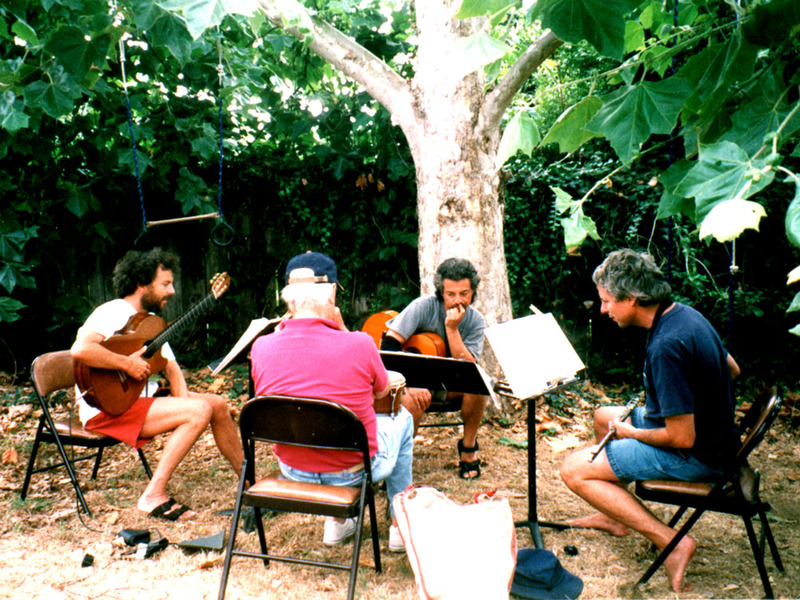 This photo is from an outdoor summer rehearsal at the tail end of July, 2001. Fred Benedetti, my brother Tripp, our father Hall, and I had been working on the new Blurring the Edges recording. Three and a half weeks of solid arranging, rehearsing, chart writing, and basic tracking at SpragueLand. At this particular moment we felt impelled to move the process to the great outdoors. What a magical month it was! Creating, hanging, playing, surfing, eating, joking, discussing music gear and computers, and having lunches on the new picnic table. We thought in this amount of time we would be able to complete the project but as usual, it took twice the time, twice the cost, details become enormous, and the prevailing mantra became clear, “it’s all about the beauty of the ride”. This second photo is from a celebration dinner we had later that day. At the end of this first chapter of the Blur recording we gathered our families and headed for the Pacific. Two hours of seventy degree saltwater blended into a wonderful meal at Encinitas’ Ogata Restaurant. The photo catches us as we’re waiting to be seated. A gang of wonderful humans—wives who pretty much understand and tolerate their possessed husband, kid’s who think that all dads have a zillion musical instruments, and three dad’s feeling blessed for this most enchanted ride. KEEP THE SKY IN YOUR HEAD! Blur hang after the rehearsal and ocean dip. 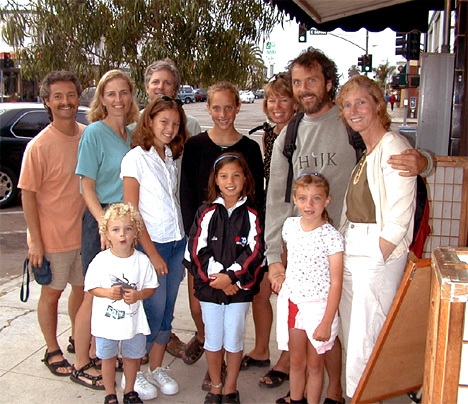 From left to right, Fred, Sophia, Sam, Tripp, Regina, unknown Benedetti friend, Julia, Amy, Peter, Kylie and Stef.